Simple cleaning routine to make your Keurig last longer, and make your coffee taste better. You’ll learn everything about how to properly clean and take care of your k-cup coffee maker. With this monthly cleaning routine, you want to reach those places that you don’t always clean on a daily basis: the k-cup holder, exit needles, area around the k-cup holder. You also want to thoroughly clean the water tank (you can do the tank more often, like once per week). This regular monthly cleaning takes only 10-15 minutes. If you have a 2.0 series brewer (K200, K300, K400 and K500), see Keurig 2.0 cleaning instructions. 2. Remove and wash removable parts: Remove the drip tray, water tank and the pod holder from the unit. Wash all the parts with mild detergent and rinse well. If you have a Mini, clean an inside of the reservoir with a damp, soft cloth or a sponge. 4. Wipe the unit: Clean out coffee grounds or any dirt left in the unit – especially around the k-cup holder and the handle, using a toothbrush or a paper towel. Wipe the rest of the unit with a damp cloth. Return all the removable parts and plug in the machine. 4. Add water and rinse: Fill the tank with fresh water and run 1 – 2 rinse cycles. Then, use as usual. Coffee grounds and oil buildups can clog exit needles and cause problems. Remove and clean the k-cup holder and exit needles at least once per month. Doing so can help prevent problems like brewing partial cups, getting grounds in your cup or not brewing at all. 3. Hold the top of the k-cup holder and push up the bottom with the other hand until removed. 4. Pull the bottom part of the holder to remove the funnel. The k-cup holder is a dishwasher safe, but you can simply rinse it with mild detergent and hot water. Don’t put your fingers inside the k-cup holder because of the needle. 5. To clean the exit needle, insert a paper clip from the bottom to push out coffee grounds if there is any. Rinse. Make sure to also clean the top exit needle (on the handle). 7. Place the holder back in the brewer. Align it with the opening and just snap into place. 8. Run one brew cycle without inserting the pod. 3. Take a new water filter and soak it in water for 5 minutes. Next, rinse it under running water for 1 more minute. Descaling is important. It helps clean mineral build-up inside your machine and can help with poor performance. It keeps your machine in a good shape and ensures good tasting coffee. The descaling process should be done every 3, 4 months, depending on the mineral content of the water in your area. 1. Fill the water reservoir with 10 ounces descaling solution. 2. Place a mug/a pitcher on the drip tray, lift the handle, wait 5 seconds then close the handle. Make sure there’s no k-cup in the k-cup holder. 3. Press the brew button. The machine will first flash red then turn solid red. Wait until descaling solution is dispensed and empty the mug/pitcher. 4. Again, add 10 ounces descaling solution into the water reservoir. Lift the handle, wait for 5 seconds, close and press brew button. The machine will flash red, then turn solid red and start to dispense. At this point, turn off your brewer and let it sit for 30 minutes. 5. After 30 minutes, turn on your brewer, open and close the handle, press the brew button and wait until descaling solution is dispensed. Discard. 6. Now, fill the reservoir with clean water only. Lift and close the handle and press the brew button. Wait until the water is dispensed and discard water from the mug/ pitcher. Repeat this rinse process 3 times. 7. Wipe the brewer with a damp cloth and you’re ready to brew your coffee again. 1. To prepare, empty water from the water reservoir, if there’s a water filter remove it, make sure there’s no k-cup in the machine, and disable the auto-off feature (to disable, press the black auto off button on top – the green auto off light should turn off). Turn off the brewer. 2. Pour 1 bottle of Keurig Descaling solution and 14 ounces of water into the reservoir, then turn on your brewer. Place a mug/ a pitcher on a drip tray. Open an close the handle and press the largest brew size. Wait until the solution is dispensed. Discard mug contents. 3. Repeat the rinse process until the “add water” light turns on. Next, let the brewer stand for at least 30 minutes. Do not turn off the machine during this period. 5. After 30 minutes, discard any residual solution from the tank and rinse well. 6. Fill the reservoir to the MAX fill line with clean water and press the brew button. Repeat the rinse step until the “add water” light turns on. Repeat again: refill the reservoir and rinse until all water is dispensed. You want to completely rinse the machine and make sure there’s no residue or smell. Two full tanks should do the job on Elite, K-Select or K55. For K-Compact you will need 3 full tanks (Keurig recommends rinsing your machine 12 times at 10 ounce cup setting). 7. Wipe the machine and all removable parts, fill the reservoir with clean, fresh water and you’re ready to brew. 1. To prepare, empty water from the water reservoir, if there’s a water filter remove it, and disable the auto-off feature if needed (to disable, press menu button twice to enter the auto off, then press and release the small cup button to move one hour at a time until you see “off”). 3. Pour 1 bottle of Keurig Descaling solution and 14 ounces of water into the reservoir, then turn on your brewer. 4. Place a mug/ pitcher on a drip tray and start dispensing the solution using the large mug button. Make sure there’s no k-cup in the brewer. Repeat the brewing step until “add water” is indicated. Let the machine stand for 30 minutes. Do not turn the machine off during this time. 5. After 30 minutes, remove and empty the water tank and rinse well. 6. Fill the reservoir with clean water only, and press the brew button. Repeat brew step until you empty an entire reservoir. Repeat: refill the reservoir with water only and press the brew button until all water is dispensed. You want to completely rinse the machine and make sure there’s no residue or smell. Two full tanks should do the job. 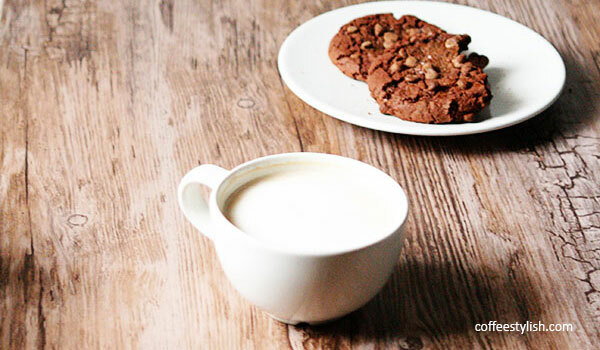 The key to a great tasting coffee starts with a clean coffee maker. Keep your machine shiny and oil-free, and brewing the best coffee at home will be much easier. I get many questions about Keurig coffee makers, so I have put together a Keurig resources page to help answer those questions. I have cleaned my Keurig 2.0 using white vinegar. I have cleaned both needles and surrounding area. My Keurig brews 2 ounces than the amount I select. Please advise. Hi Teresa, since you’ve already descaled your machine and cleaned exit needles, make sure to also check the valves at the bottom of the reservoir (right where the filter goes) and on the machine (when the tank goes) to check if it’s not clogged and there’s no dirt or buildups. This can sometimes cause problems too. If everything seems fine, but you’re still only getting 2-ounce drink size, please call Keurig customer service at 866-901-2739 to help you troubleshoot your machine. I’ve completed all the trouble shooting steps and when I brew a cup of coffee it’s still full of grounds. So disappointing ? Looks like my machine is ready for the dump ? So I keep getting The water under pressure in my Keurig 2.0. I went through every cleaning solution possible. So finally called the company and they replaced. The second day of having my brand new machine is doing the same thing which is telling me it may possibly be a problem with my reusable Kcup. I have the little purple plastic ones as well as a stainless steel eco brew and both of them are still giving me this problem even though I don’t overfill the pod. I know a lot of other people that have no problems using the reusable pod’s so I’m not sure why I have such problems. Hi Erica, the water under pressure error usually has to do something with the exit needle, but since you’ve already cleaned it and you now have a brand new machine, this isn’t the problem. Do you get this message when you use regular k-cups? If it’s working fine when you use original pods then a reusable pod might be the reason. You can try using less coffee. Also, make sure not to press the coffee down with a spoon when filling the pod. Just add coffee up to the max fill line and tap the pod to level the coffee. If this is how you normally fill the pod or the problem persists, maybe you can switch to original Keurig 2.0 reusable pod. If you get the same error even if you use original pods, then it’s the machine and you should call Keurig customer service again. I hope this helps. My Keurig says Ready To Brew but only one size is lit (there are 3 sizes). When I touch it, sounds like it is trying to brew but nothing comes out. Sounds like it is trying to pull water in but nothing happening. Runs for quite a while then sounds like it is finished but nothing has come out and still doesn’t, draw any water in. I have shut it down completely but nothing new happens.. also, can I clean the unit with vinegar? Hi Donna, try cleaning and descaling your machine. Please make sure to clean top and bottom exit needle to make sure they are not clogged, the k-cup holder and the area around the holder. Also make sure to clean the valve on the tank and on the machine, where the tank goes. It’s best to use Keurig descaling solution but you may use white vinegar too. Fill a tank about half full with vinegar and fill the rest of the tank with water, then follow descaling instructions. I have only been using my brewer one month and had no issues until today. Every time a try to brew a cup, it does fine until it’s almost finished and then it dumps a huge amount of coffee grounds in my cup. I have taken it apart and cleaned it , needles too, after this happened several times but continues to do this. I have wasted so many K-cups trying to resolve this. My brewer is a 2.0. Now what? Hi Ray, please make sure not to use softened water in your machine since it can cause this problem. If you use bottled or filtered water and the machine brews a full cup but you always get this messy result, I recommend calling Keurig customer service to help you troubleshoot your machine. Some amount of grounds is normal, but if you always get a cup full of grounds, you should call customer service. Hi Cindy, please try cleaning the reservoir again. Remove the water reservoir and discard the water. Hand wash it with mild soap and non-abrasive cloth and rinse. Plase also check the valve at the bottom of the tank and on the machine where the water tank goes. The valve can sometimes get clogged and this can cause problems. Make sure to clean both exit needles as well. If you have already cleaned and descaled the unit, you follow all these steps, and it still doesn’t work, it’s time to call Customer service. Keurig Customer service is available at 866-901-2739. I have descaled and cleaned my keurig 3 times in the last 2 months. The last time was yesterday and the decals light is already back on. Is my machine unfixable? Hi Peggy, there is a chance that there are some particles stuck in the machine. Please make sure you clean both exit needles, check the valve at the bottom of the water tank to make sure there is no dirt and it’s not clogged somewhere. You can also try shaking/tapping the machine – unplug the machine, remove the reservoir, turn the machine upside down, shake slightly and tap the bottom a few times. Place the reservoir back and run few rinse cycles. If the problem persists , please call Keurig Customer service at 866-901-2739 to help you troubleshoot your machine. I hope this helps! While descaling my brewer never said “add water” but it is totally empty. Should I just wait 30 minutes and proceed? Hi Dianne, what model do you have and is the “add water” indicator usually working? Please try running brew button one or two more times to see if the button will illuminate (unless you have mini or k15, they don’t have the add water indicator). Maybe there’s still some water in the inner tank. If the add water button is usually working but it won’t work now, I recommend calling Keurig customer service at 866-901-2739 to help troubleshoot your machine and guide you through the process. You can probably just wait and processed after 30 minutes, but in these cases, it’s best to call customer service especially if the machine is still under warranty (otherwise the warranty may not apply if the machine is not used or descaled as recommended, and we don’t want that). I hope this helps! The word prime appears on the screen. What does that mean? the prime indicator means the water is not coming out from the reservoir into the brewer. Here’s a YouTube video tutorial on how to solve the prime error. I hope this helps. When I use the prepackaged cups water runs all over and my mug doesn’t fill up. Grounds and water stays in the prepackaged cup. Hi Pamela, I recommend cleaning the k-cup holder and both exit needles. Sometimes this can happen if the exit needle is clogged. Make sure to clean both – top and bottom needle with a paper clip. If you already cleaned them and the machine is still not brewing a full cup, please call Keurig customer service at 866-901-2739. I have K150 coffee maker. When i use 12 oz.button, its brew about 8-10 oz. I clean every part of it and still not dispensing right amount. If you have already descaled your machine and you have cleaned brew head and the exit needle and it’s still not dispensing the right amount of water, the only option is to call Keurig support at 1.866.901.2739. I have a K-50 that is leaking water. Unable to find the source. When told to change the filter, what filter?? Cannot find one anywhere !! Hi Tom, did you spoke to Keurig Customer Service representative?! He was probably referring to water filter in the tank (not sure if you use water filter) but I don’t understand what filter has to do with leaking because replacing the water filter won’t solve this problem. From my experience, when Keurig leaks is usually has to do something with a valve/ water pump inside the machine or it’s clogged somewhere. I recommend to try descaling your unit first. You can also try this quick fix : unplug the machine, remove the reservoir, turn the machine upside down, shake slightly and tap the bottom few times. Then put the reservoir back and turn the machine on to see if it will work normally. I know it sounds funny, but it often helps. If these two things don’t work, it’s probably the valve or the pump and I don’t recommend to try fixing them on your own. In that case it’s best to call Keurig customer service at 1.866.901.2739. Let me know if you need anything else. Thank you, will try what you suggested. I have tried all the tips I can and note have worked. Message clean needle still appears. I guess I have to make the walk to the trash. Won’t buy a Keurig again. Thank you so much for these suggestions. For over a month, my Keurig 2.0 has been sputtering coffee and way after the brew is complete, liquid was still coming out. I followed the instructions and took it apart. I never cleaned (besides the drip tray). There was so much coffee sludge caked inside. Lonh story short, back to new. Thanks again! When I plug in mine in it says preheating but it is dispensing water the whole time. Can’t get it to stop. It will empty the water reservoir. 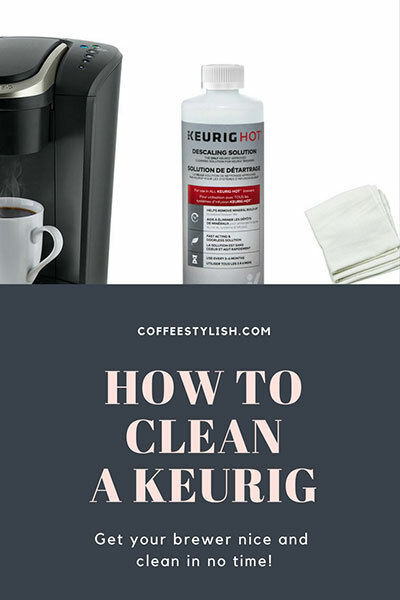 Hi Rebecca, you can first try cleaning the exit needle (here’s how to clean it https://coffeestylish.com/how-to-clean-a-keurig/ ). This normally helps. If it doesn’t, you can also try this fix: unplug the machine, remove the reservoir, turn it upside, tap the bottom, and shake it a little bit. Then put the reservoir back (you don’t have to fill it to the MAX just in case), plug in, turn the machine on see if it will work. If this doesn’t help, it’s time to call Keurig customer service. Good luck! I have cleaned and all parts of the dispensing unit as advised and descaled as best I could. My machine is dispensing hardly any water. I can hear the pump working but it will still not work correctly. Frustrated! Any suggestions? if you’re still having issues with your brewer, please call Keurig Customer Service at 866-901-2739 to help you troubleshoot your machine. Hi my Keurig 2.0 won’t turn on it has power going to the unit but when I press the power button nothing happens please advise. Hi Alex make sure you press and hold the power button. You should see a welcome! note. If it doesn’t turn on you can do few things: Check to make sure that the brewer is plugged securely. Unplug and plug in the brewer. Plug the brewer into a different outlet. As a last step, Keurig even recommends resetting your home’s circuit breaker just in case. If nothing works, then you should definitely call Keurig customer service. Sorry for the late reply. Thanks, very helpful. We use a reusable keurig k cup, not the prefilled ones. I couldn’t believe the buildup. Solved my problems. Will do a full cleaning on my k200 monthly. Thanks for the cleaning tips. Very helpful and I have coffee again!! Hi Deb, unfortunately, the only way to drain out the inner reservoir completely and clean it out for shipping/or to store it is to disassemble the unit! You need to open the machine, disconnect hose and inner reservoir and try to get the water out. If it’s not a must, I wouldn’t recommend this because it’s not a simple thing to do and it can sometimes damage the unit. Of course, Keurig doesn’t recommend it neither. I would just turn the brewer off, unplug it, empty out the removable water reservoir and make sure it stays in an upright position to avoid water leakage while moving. I hope this helps and let me know if you need anything else. Hey Danijela, I just wanted to stop by and say thank you so much for sharing my video! Your website is great too – love all the coffee info, what a great resource! I try to make easy cleaning tips and tricks and post them on my blog so come and check it out any time. Thanks again! Sincerely, Melissa. Hi Melissa, you are welcome!